Quotes and proverbs of wisdom from Norwegian Vikings and famous explorers! Quotes and proverbs of wisdom from explorers have guided me on my journeys around the world. Some of them are from Norwegian Vikings, and other are from great travellers as Captain James Cook, Thor Heyerdahl and Rudard Kipling. First of all I will say these quotes are for wisdom, but also for inspiration, motivation, attitude, behaviour and humour. Photo. 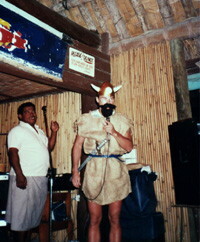 Sigbjørn, a Viking traveller from Norway, following wise advises from his forthfathers, The Vikings. His favourite moto on his journeys is: Smile to the world, and the world will smile to you. "A journey of a thousand miles must begin with a single step", according to an old Chinese Proverb. The first step in my opinion is gathering useful information for the journey, but if you consider the world as a book there is another proverb for this: "The world is a book. He who does not travel only reads one page" (St. Augustine). Actual, travelling is about learning of life: "He that travels far knows much". I have collected some quotes especially suitable for travelling. It could be a good idea to keep these quotes in mind when you are travelling and communicating with people with another lifestyle and cultural background. The mentioned explorers show way for others, and we can learn many things from them. Our most important baggage on our journeys is wisdom! One should not ask more than would be thought fitting. Never break the peace which good and true men make between you and others. James Cook, known as Captain Cook: 1728-1779, was a British navigator and explorer who commanded three major voyages of discovery, charting and naming many islands of the Pacific Ocean. He also sailed along the coast of North America as far north as the Bering Strait. 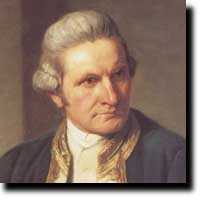 Captain James Cook is widely renowned as an explorer, pioneering navigator and preventer of scurvy. You are never giving, nor can you ever give, enough service. "... I had ambition not only to go farther than any one had been before, but as far as it was possible for man to go ..." - James Cook, R.N. “Do just once what others say you can't do, and you will never pay attention to their limitations again.” - Captain James Cook. The Just So Stories for Little Children were written by British author Rudyard Kipling. They are highly fantasised origin stories and are among his best known works. The stories, first published in 1902, are fantastic accounts of how various natural phenomena came about. A introduction to these stories is "How Fear Came" in The Second Jungle Book (1895), in which Mowgli hears the story of how the tiger got his stripes. 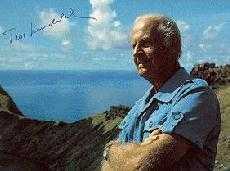 Thor Heyerdahl from Norway was a great explorer and adventurer. He was a real friend of the world. It says in the Bible, in plain words, that God made a self-portrait. He created man in His own image - man and woman - for God is Love.Why should we start thinking of a god up in the clouds with wings, if He dwells within us in the spirit of Love?! "Don`t go where the path may lead you, go instead where there is no path and leave a trail". Francis Bacon: A wise man will make more opportunities than he finds. Franklin D. Roosevelt: The only limit to our realization of tomorrow will be our doubts of today. - The expedition group want to be the first Norwegians reaching the top of the world`s most challenging mountain K2, which is 8.611 meter high. - The expedition want to do by fair means, it means without extra oxygen and without assistance of porters above Base Camp. 1. Everybody shall return home alive and in good condition. 2. We shall return home as better friends than before we started our tour. 3. One or more shall reach the top of K2. Remember that happiness is a way of travel, not a destination." "Happiness is not a state to arrive at, but rather a manner of traveling." "A truly happy person is one who can enjoy the scenery on a detour." "The true traveler is he who goes on foot, and even then, he sits down a lot of the time." * "When in Rome, do as the Romans do." "If you don't climb the mountain, you can't see the view. " Hopefully this selection of travel quotes and proverbs, may provide some inspiration advise for your journey ahead. Read about unique travel explorations and adventures on our website Travel Explorations: www.TravelExplorations.com.